When winter says goodbye, it’s time to embrace the blazing and breezy summer season. For most people, the best way to survive the summers is by using a sunscreen cream, wearing a hat outdoors, sitting in an AC room, and drinking lots of water. The other popular way to beat the heat is going on a holiday to some cool destination. So, this summer you can remain cool by visiting these beautiful and stunning places to visit in India in April. With its picturesque beauty and natural setting, Kashmir is rightly called the paradise on earth. The summer capital of Jammu and Kashmir, Srinagar is surrounded by snowy white mountains during April. It is at its prime beauty during the spring season with the blossoming of tulips. The Tulip Festival in the month of April attracts a lot of tourists and makes Kashmir a must visit among the places to visit in India in April. The main attractions of the festival are the cultural songs, the showcase and sale of local handicrafts, and Kashmiri folk dance performances. April is the best time to escape the heat of the summer and enjoy the cool and breezy weather of Kashmir. Weather in April: The weather of Kashmir is pleasant during April, as the temperature is not too high, and there are showers too now and then. The temperature in April varies from 14°C to 30°C. Major Attractions: The winter capital Jammu and the summer capital Srinagar, Katra, Leh, Gulmarg, Kupwara, Sonmarg, Doda, Pulwama, Pahalgam, Patnitop, and others. 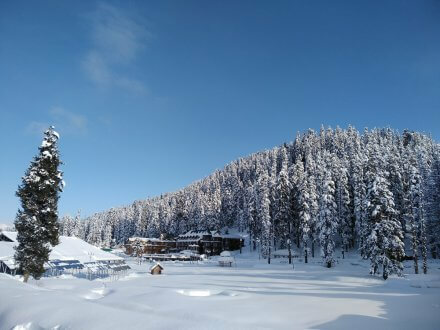 Best Experiences: Skiing in Gulmarg, Sleigh riding, trekking, ice skating, ice hockey, Heli-skiing, shopping, enjoying the local cuisine, etc. By air- Visitors can book tickets in any domestic flight from any major city of India to Srinagar Domestic Airport. By train- Visitors can book tickets to Jammu Tawi railway station. It is the nearest railway station to Kashmir and is located around 200 km from the city. By bus- There are reliable and affordable bus services to Kashmir from nearby cities. Dalhousie is a must visit place for travel enthusiasts. It is a mountain retreat that remains covered with snow throughout the year. If you want to beat the summer heat, Dalhousie is a perfect place for your vacation. One can seek refuge here from the monotony of city life. Even though the place is not ideal for adventurous sports, one can simply enjoy the beauty of nature by taking a stroll. With its portrayal of nature as it is, it is the best place to visit in April in India for nature lovers and travel enthusiasts. Weather in April: The weather of Dalhousie is pleasant during April, and it is ideal for leisure holidays. The evenings are cooler even during the summer days. The temperature ranges from 15 to 30 degree Celsius. A weekend trip is a great idea as you can enjoy most of the things to do in Dalhousie in 2-3 days. Major Attractions: Kalatop wildlife reserve, St. Francis Catholic Church, Panch Pulla, Ganji Pahari, Satdhara Falls, Rang Mahal, Chamera Lake, Dainkund Peak, Sach Pass, St. Patrick’s Church and many more. Best Experiences: Drown yourself in the magnificent views of Panch Pulla, take a dip in the Satdhaara Falls, indulge yourself in a boating spree on the Chamera Lake, trek to the Kalatop Wildlife Sanctuary, and others. By air: Book a flight to Pathankot Airport, the nearest airport to Dalhousie. By train: The nearest railway service to Dalhousie is in Pathankot. It is 60 km away and is connected to many major cities in India. By bus: There are local bus services available from Kangra, Dharamshala, Khajjiar, and Chamba. Bus services from other far-off places like Chandigarh and Amritsar are also available. Dharamshala is a gem in the crown of Indian tourism. This place will let you experience the beauty of nature in the most surreal way. It is surrounded by mountains and extravagant flora. This place with its magnificent and extraordinary snowfall is one of the most sought after places to visit in India in April. Dharamshala is famous as the abode of Dalai Lama and is the religious centre for Tibetan Buddhists. The pleasant weather in the month of April makes Dharamshala an ideal place for a vacation to escape the summer heat. Weather in April: The weather of Dharamshala is pleasant during April when the snow starts melting. The temperature varies from 20 to 35 degrees Celcius and is perfect for sightseeing during the day time. Major Attractions: Tsuglagkhang Complex, Namgyal Monastery, Kareri Dal Lake, Bhagsunag Temple, Bhagsunag Waterfalls, Gyuto Monastery, Gyuto Monastery, HPCA stadium, Tibetan Museum, Kalachakra Temple, Kangra Valley, and the War Memorial. Best Experiences: Paragliding, Triund Trek, Camping, Kareri Lake Trek, Trip to Kangra Valley in Dharamshala, Trip to Galu Temple, Sightseeing Tour of Dharamshala, Camping and Trekking at Lahesh Caves, and others. By air: You can book a ticket to Gaggal airport which is the nearest airport to Dharamshala, only 13 km away from Dharamshala. By train: The Pathankot railway station is the nearest. It is 85 km away from Dharamshala. By bus: There is a bus service offered by private bus operators. The roadways of the major North Indian cities are well-connected with Dharamshala. Situated between the mighty Pir Panjal and Dhauladhar ranges, Manali is one of the best places to visit in India in April. 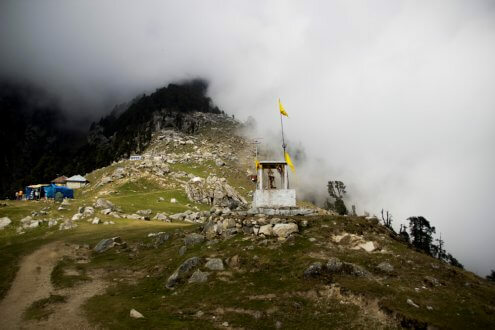 It is the centre of Himachal Pradesh and offers exhilarating views of the Himalayas. It is surrounded by Pinewood forests, and adventure loving people can engage themselves in trekking, rafting, gliding, and other activities here. Visitors can also buy high-quality woollens and saffron from Manali. Weather in April: The weather of Manali is pleasant during the day. The weather is ideal for paragliding, rafting and mountain sports. The temperature is between 10°C to 25°C. Major Attractions: Hidimba Devi Temple, Museum of Himachal Culture and Folk Art, Tibetan Monasteries, Jogini Falls, Solang Valley, Rohtang Pass, Bhrigu Lake, Pandoh Dam, and Great Himalayan National Park. Best Experiences: Enjoy the music of the waterfalls, pay a visit to the temples, get engaged in adventurous sports, indulge yourself in a historical retreat, practice some yoga exercises, explore the wilderness, go on a bike ride to Rohtang Pass, and others. By air: Book a flight to the Bhuntar Airport that is the nearest airport. It is only 50 km away from Manali. By train: Take a train from Delhi to Ambala Cantt, and then take a cab or bus to reach Manali by road. By bus: There are private and state-run bus services provided from different parts of North India. 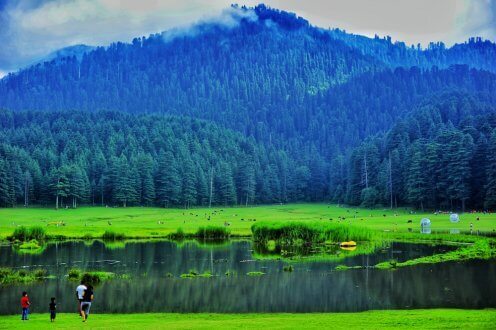 Referred to as the Mini Switzerland of India, Khajjiar has snow-covered mountains all around in most parts of the year. 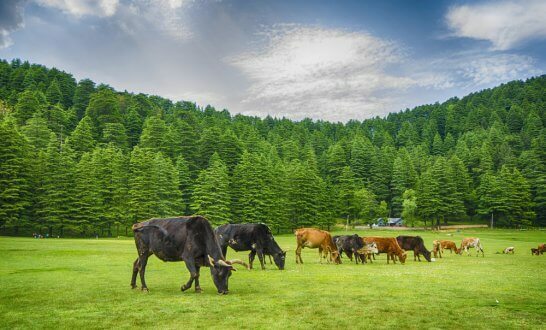 The place is ideal for visiting anytime during the year, but if you want to escape the summer heat, Khajjiar is the best place to visit in April in India. Due to its scenic beauty, Khajjiar attracts a lot of visitors all through the year. You can experience the thrill and fun of paragliding too in this place. Weather in April: The temperature of Khajjiar varies from pleasant to hot during April. However, the temperature remains cool during the night. The temperature ranges from 17°C to 30°C. Major Attractions: Kalatop wildlife sanctuary, Kailash villages, Panch Pandav tree, Khajjiar Lake, Golden Devi temple, Khajj Nag Temple, and Tibetan Handicrafts Center. Best Experiences: Indulge in adventure sports, take a trip to the Khajjiar lake, visit the Kalatop wildlife sanctuary, enjoy the Khajjiar trek, paragliding, and others. By air: You need to fly to Gaggal Airport and take a cab from there. By train: The nearest railway station is located at a distance of about 118 km in Pathankot. By bus: Regular bus service is provided, and the place is well connected with most neighbouring towns and cities. Listed above are only some of the places to visit in India in April. There are many more destinations to get away from the scorching summer heat. Places with pleasant weather are the best to visit during the summer days, and you should definitely try the places in the above-mentioned list.